In this section, several design ideas for MTVs are reviewed and compared in order to produce a basic design concept for Adeona. The Mars Transfer Vehicle (known as Adeona) carries the crew to Mars. In Blue Dragon, as in the DRA, the MTV also brings the crew back to Earth. This is in contrast to Mars Direct, in which the crew launch from Mars and fly back to Earth in the ERV. Adeona is constructed on orbit, only used in space, and does not land on any planetary surface. An MTV, or at least, the process of getting the crew to Mars and back, is arguably the most challenging component of HMMs to design, and surely the most expensive to build when considering the total cost of development, materials, propellant, launches and construction. For these reasons, it’s the one element that tends to generate the most innovation, as mission designers look for creative ways to transport humans to Mars more cheaply, quickly and safely. The only currently available form of propulsion that could potentially be used for a trip to Mars is chemical propulsion. However, an MTV requires hundreds of tonnes of propellant to reach Mars, irrespective of the choice of propellant. Travelling to Mars via chemical propulsion is slow, with one-way trip times of around 5-8 months. This increases cost due to the amount of supplies that must be carried on board, plus measures necessary to protect the crew from radiation while in space, such as shielding. Rockets are large, complicated and expensive, and, as yet, neither reusable nor mass-produced. Thus launch costs are still very high. We don’t currently have any SHLLVs flying, which increases the number of launches needed to construct and build an MTV, and making on-orbit assembly a likely requirement. Both of these inflate the cost. All the propellant and rockets are currently on Earth, which means propellant must be transported from the surface of Earth to Earth orbit. This is expensive. Transfer and storage of cryogenic propellant in space incur losses due to boil-off, which increases the initial quantity of propellant to be launched from Earth, and therefore also the cost. Current technology does not provide a way to keep astronauts 100% healthy in the interplanetary environment, which means trip times must be kept as short as possible. This means bigger propellant burns when entering and exiting orbit at both Earth and Mars, further increasing propellant requirements. Currently available materials that would be strong enough for an MTV are still very heavy, which increases launch costs. It also increases the quantity of propellant required to move the vehicle, which also increases launch costs. We’ve never done it before, which means most of the necessary hardware needs to be developed from scratch, and extensively modelled and tested. Engineers, tools, and manufacturing and testing facilities are also expensive. Faster/better/cheaper methods of space transportation. Ideas that have been, or are currently in development (or at least discussion), include nuclear thermal rockets, ion thrusters, field propulsion, space elevators, antimatter rockets, wormholes, warp drive and more. Reusable rockets, such as those currently in development at SpaceX. This should reduce launch costs significantly, since each rocket can be used for multiple launches instead of just one. Technologies and systems for on-orbit transfer and long-term space storage of cryogenic propellant. More advanced materials and manufacturing processes that will result in improved radiation shielding, lighter spacecraft components, higher performance rocket engines and zero boil-off propellant tanks. Technologies for creating artificial gravity fields. Asteroid and lunar mining to create propellant sources in shallower gravity wells (if chemical propulsion is still relevant in the same timeframe). Space manufacturing to produce spacecraft components and other hardware in shallower gravity wells. Missions can be launched every 26 months instead of every 52. One serves as a backup for the other. A generous 22 months are available between an MTV’s return to Earth orbit and its next departure for Mars, in which time it can be refurbished and refilled it with propellant, and training missions conducted. As discussed earlier, it is likely to be preferable to fit out the B330 on Earth rather than launch it deflated and fit it out on orbit. This strategy doesn’t fully take advantage of the benefits of an inflatable habitat, which is to reduce launch costs by launching the module in a deflated state, thus permitting the use of a smaller rocket. However, sending people to Mars is a considerably more ambitious mission than constructing on-orbit space stations, and budget should be available to use a larger vehicle capable of launching a completed THAB. Fit-out of the THAB on Earth by expert engineers and tradespeople with access to the best tools will produce a much better result than sending up one or more small crews to attempt such tasks as installing furniture and computer systems in microgravity. Because the THABs are reused, a minimum of only two need to be built and launched anyway, which justifies the higher cost of launching them fully fitted out. 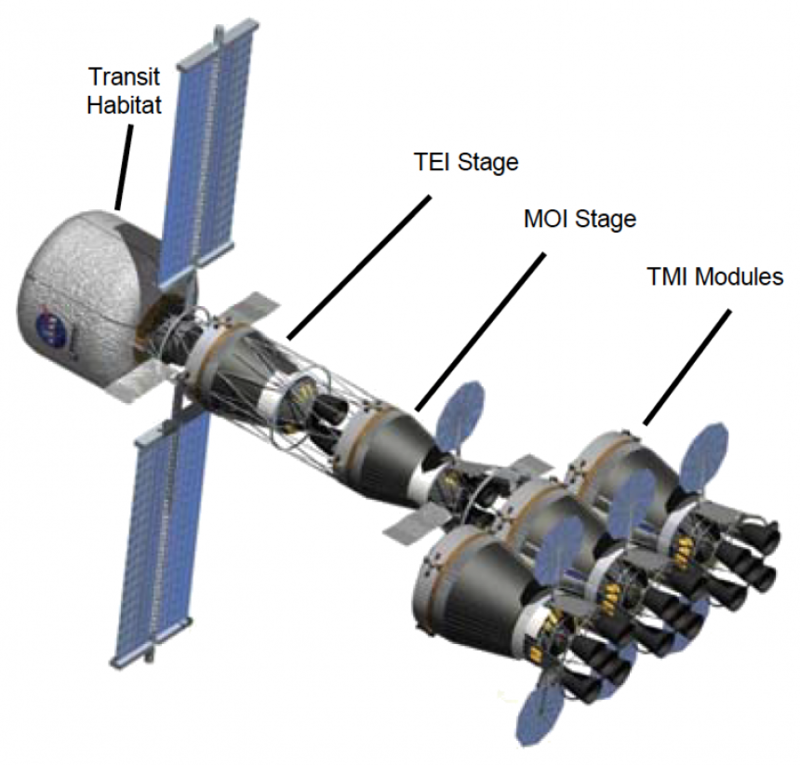 The THAB will be designed for a microgravity environment. The internal volume may be divided into rooms or sections by adding walls or “floors”, either parallel or perpendicular to the habitat’s axis. The THAB is large enough that each crew member can be allocated their own private space where they can sleep, read, receive personal communications, meditate, listen to music, and activities of this nature. 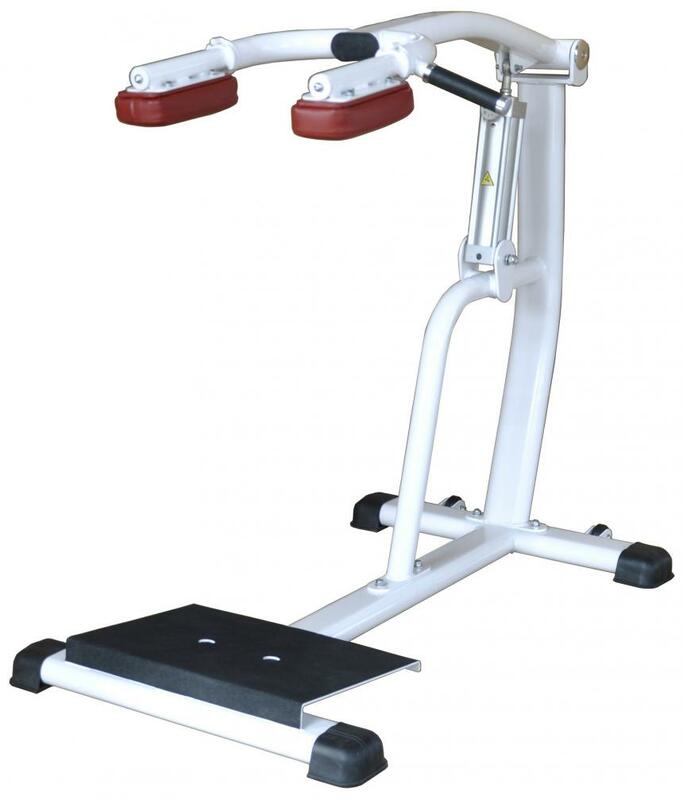 As discussed in Health and Fitness, it is necessary to provide the crew with exercise equipment for both cardiovascular and strength training. This equipment will be located in a room that may also double as a medical bay, complete with the equipment necessary for blood work and other health examinations. A dedicated area will be necessary for morning meetings, with computers for inspecting the spacecraft condition and other work, and communicating with MCC on Earth. Here may also be located the ship’s proxy server, which maintains a local cache of research material, multimedia, websites, games and other software, and acts as an internet gateway, providing the crew with online services such as email and social networking. A dedicated area where food can be accessed, prepared and consumed without the risk of it floating around the ship and affecting experiments or instruments. Half the crew will be scientists, and they will wish to take advantage of the unique opportunity to conduct research in deep space. The crew members will design and prepare experiments that align with their particular interests. A particularly useful experiment will be growing food in space, such as strawberries, to add variety and pleasure to the crew’s diet. In Mars Direct the crew fly out to Mars and land on Mars in the SHAB. They launch from Mars and return to Earth in the ERV, which performs a direct entry into Earth’s atmosphere. In the DRA, the crew travel out to Mars and back in the MTV, with an Orion capsule docked. As the MTV approaches Earth, the crew transfer to the capsule, undock, and perform direct entry into Earth’s atmosphere, splashing down in the ocean. The MTV continues past Earth to enter orbit around the Sun. In Blue Dragon, the crew fly out and back in the same vehicle, as in the DRA. However, on return to Earth, Adeona is captured into HEEO, then descends to LEO. A Falcon 9 with the Earth Descent Capsule is then launched from Earth, it docks with the THAB, and the crew descend to Earth. Adeona can then be reused in subsequent missions. There is little room for error. In the case of Mars Direct, the propellant burn must be exact in order for the ERV to enter Earth’s atmosphere at precisely the right moment and angle so that it won’t burn up, skip out, or crash. In the DRA, for the same reasons, the Orion capsule must be released at precisely the right moment and angle as the MTV flies by Earth. A fast, direct-entry EDL is risky, dangerous and stressful for the crew, subjecting them to very high g-forces. The return vehicle is lost; to run another mission will require building another. Another disadvantage of the Mars Direct approach is that because the ERV is launched from Mars it must be made very light. The living volume must therefore be minimised, which could be unpleasant for the 6-month return trip. A disadvantage of the DRA approach is that the Orion capsule for Earth descent must be carried all the way to Mars and back, adding a nontrivial mass penalty. Adeona, an expensive piece of hardware, will not be wasted, can be used repeatedly, making it cheaper, quicker and easier to run each mission. 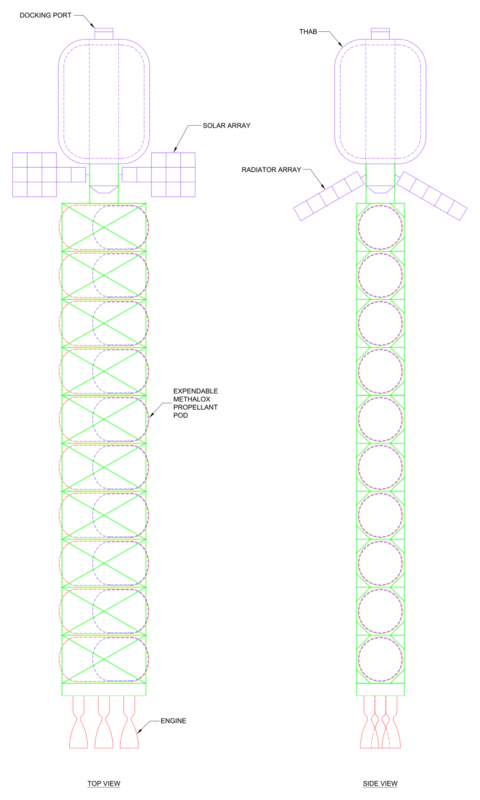 This reduces space debris and spares the considerable cost of building a new MTV. It will be much easier to get approval from sponsors for another HMM when there’s already a perfectly good vehicle ready and waiting in LEO. Like an airplane, in principle the vehicle will only need a maintenance inspection and refilling with propellant to make it ready for the next mission. The THAB can be cleaned, and Adeona repaired and/or upgraded as required. The mass of additional propellant is partially offset by the mass of Newton (the Earth Descent Capsule), which doesn’t need to be taken all the way to Mars and back. The deceleration forces experienced by the crew during Earth EDL are significantly less when descending from LEO than when approaching by direct entry. This is safer, and considerably less risky and stressful for the crew. Descending to Earth in this way will be reasonably routine for the crew, having done the same thing several times before, both from the ISS and from Adeona during training. Once the THAB is on Earth orbit there will be plenty of opportunities to launch a capsule to pick up the crew. Newton can land on solid ground back at the launch pad, eliminating the need for a water recovery and simplifying quarantine procedures. As discussed below, reuse of the THAB takes advantage of the tweaks, refinements and homely touches made by previous crews, as with FMARS and MDRS. Training missions can be conducted to the MTV immediately without having to wait for financing and construction of a new one. Each MTV will have their own unique name and associated character, like ships of the sea. The word “astronaut” means “star sailor”, after all. Crews, not to mention the millions of fans, will be reluctant to see them simply discarded. During the 6-month outbound trip, the crew will make the THAB their home. They’ll humanise the space, putting up posters, sticky notes, hooks, photographs and knick-knacks, with each person making little tweaks to the environment to suit their individual behaviours and preferences, and to improve safety and comfort. They’ll develop routines that work with the spacecraft and develop protocols for co-habitation in the relatively confined volume. They’ll learn the various quirks of the vehicle, and find a whole range of optimisations and workarounds. The vehicle’s server will have all their favourite music, movies, books, games and websites already downloaded. They will fix and improve things — an improvised washing line here, a cable-tie or pencil-holder there. This is one of the many things people do to personalise a space, and it has significant psychological value. This is another reason why it will be better to use the same vehicle for both outbound and return legs, and also to retain the THAB for multiple missions. For the spacecraft’s designers, decorations and personal touches will be a secondary consideration compared with the primary function of the hardware: to keep the crew alive and carry them safely to their destination. The designers of the THAB interior are unlikely to consider everything six unique individuals will need or want in order to create a comfortable living and working space for 1 year. The crew will fill these gaps themselves during their period of habitation. By using the same ship for both outbound and return trips, there will be a sense of familiarity, almost home-coming, when they re-enter Adeona for the return journey. Everything will already be prepared, by each crew member, for themselves; they can return to the comfort of their individual sleeping cabins, prepared on the way out to Mars. This will have a positive effect on morale and will eliminate the time cost of personalising a separate return vehicle in the same way as the outbound vehicle. In the event that any members of the crew are coming back from Mars sick or injured, having a familiar environment will even be important. When the same THAB is inhabited by new Mars crews, this will also have important psychological benefits via a powerful feeling of connection with past crews, and a feeling of confidence in the tried-and-tested vehicle and habitat. New crews can draw inspiration from, and add to, the various marks and refinements made by previous ones, as has happened over the years in FMARS and MDRS. The THAB is a valuable mission artefact that one or more crews of “marstronauts” have made their home for a year. If a new one is created for each mission, the only sources of ideas for improving the design would be astronaut reports and memories, and video footage. A physical artefact is significantly more useful. The original designers will not think of everything, hard as they may try; every mission to Mars and back will reveal new ideas for how the MTV needs to be improved. There’s no doubt that getting to Mars and back is the most expensive part of the program; at least for now. There’s simply no getting around this until space technology improves. This provides a strong incentive to come up with an innovative, lean vehicle design within the constraints of the available resources; and to make the vehicle reusable. If the intention is truly to run numerous missions to Mars, then reusability is essential for cost-effectiveness. Reusing the MTV will provide an opportunity to perform maintenance and make repairs or improvements to the engines, propellant system, solar panels, radiator arrays, computer and life support systems, or any other components, depending on available finances and priorities. Additional inflatable modules could be added so that the vehicle can support larger crews, along with lengthening of the structure to provide additional propellant pod bays and engines. To illustrate the cost benefit, let’s imagine an MTV that costs $1 billion to construct, but is completely discarded at the end of each mission. A new one is required each time; therefore, for three missions, the cost of building MTVs is $3 billion. Now let’s estimate that the cost of building a reusable MTV is $1.5 billion, due to the additional propellant. However, to refurbish the MTV and refill it with propellant for subsequent missions costs only $150 million. The total cost for three missions is therefore $1.8 billion — a saving of 40%. And there’s no reason to stop at three missions. A minimum of two MTVs are required because of the mission timetables. However, the same mathematics applies, and becomes more apparent when a minimum program of 10 missions is assumed. Using the same rough estimates, constructing a new MTV for each of 10 missions would cost $10 billion. However, with two reusable MTVs, each being used for five missions, would only cost $4.2 billion (2 * $1.5 billion + 8 * $150 million) — a saving of 58%. Clearly this could mean the difference between a small number of missions, as described in the DRA, or a large number of missions, which is the goal for IMRS. A small number of missions carries the risk of an Apollo-like result, i.e. a decade of awe-inspiring achievement and glory followed by decades of tooling around in LEO. In contrast, an ongoing series of missions focused on accumulating hardware and infrastructure on Mars will lead to settlement and the establishment of a new branch of civilisation. Reusable MTVs may cost more, but their value to the human race are inestimable. It must be considered that, while government terms of office are typically 3-5 years, the IMRS program will span at least 20-30 years. Because reusability greatly reduces the cost of future missions, the likelihood that those missions will be approved by new governments is much higher. When Adeona is replaced by a new vessel, she can be repurposed. For example, it will be possible to run training missions to the spacecraft, operate it as a space station or laboratory, use it for human missions to other destinations in the Solar System, rent or sell it to private enterprise, or even provide tourist experiences or preserve it as a museum. After all, it will be a tremendously historic artefact. A new propulsion mode such as electric, ion, warp, or field propulsion may need to be developed before rapidly reusable MTVs are practical. Alternately, a nearer-term solution may yet be realised with the benefit of nanostructured materials, which will produce spacecraft hardware so much lower in mass that a fully reusable MTV using chemical propulsion could become more practical. The ultimate goal is an SSTO (Single Stage To Orbit) spacecraft that can rapidly fly from the surface of Earth to the surface of Mars, refill with propellant from local Martian resources, and fly back to the surface of Earth, all without discarding any major pieces of the vehicle and without even needing to wait for an optimal launch window at either end. Once such a vehicle exists, a process of settlement can develop in earnest. The DRA examined three basic options for in-space propulsion: chemical, electric and NTR (Nuclear Thermal Rocket). Of these, NTR was preferred. Blue Dragon, however, favours chemical propulsion. Chemical propulsion is well-proven, has a much higher TRL, and is much cheaper, safer and better understood than NTRs or any other form of propulsion. A mission can be designed around chemical propulsion without much guesswork about cost and performance. The salient features of the IMRS program — safety, low cost, and minimal development time — all point towards chemical propulsion. The primary benefit of NTRs is their relatively high Isp, of the order of 1000 seconds. This is more than twice LOX/LH2 (liquid oxygen and liquid hydrogen) and almost three times that of methalox, which means much less propellant is required. However, NTRs would be much more expensive to develop, as their TRL is still quite low. Although some development work on NTRs has been completed, none have ever actually flown. The NERVA (Nuclear Engine for Rocket Vehicle Application) program flight tested several NTR components; however, that program closed in 1972, which is over four decades ago at the time of writing. Project Timberwind and the Space Thermal Nuclear Propulsion program conducted further research into NTRs, however, failed to reach their objective of flight testing an NTR upper stage, and the program was closed in 1994 (two decades ago at the time of writing). Some in the space community believe that NTRs will never be funded to full development, and that constructing Mars missions based on NTRs creates an artificial obstacle. Others believe that, with new technology, much better NTRs can now be developed at much lower cost. An NTR is a minimally-shielded nuclear fission reactor, which, most would agree, is rather a dangerous piece of equipment. In the event of failure, the entire spacecraft including the crew could be exposed to high levels of radiation far more harmful than a solar particle event. The use of NTRs in near-term Mars missions may technically be possible, but for other reasons seems unlikely. They would take much longer and cost more to develop, would be difficult to get approved and to test, are more dangerous, and are unnecessary. In addition, most NTRs use hydrogen as the working fluid, and, as discussed below, hydrogen has its own set of problems. Exotic propulsion systems that reduce the time and cost involved in getting to Mars will indeed be valuable to future missions, and essential for future expansion into the Solar System, Milky Way and Universe. However, just as sailing ships were perfectly adequate for worldwide European expansion without needing to wait for steam ships or aeroplanes to be invented, chemical propulsion is available now and is perfectly capable of transporting crew and cargo safely to Mars. A 6-month flight to Mars is comparable to an 18th century ocean voyage from England to Australia, except considerably more comfortable, as the crew will be living in environment-controlled conditions with plenty of amusements, food and water, and always able to communicate with friends and families. In fact, there’s a valuable benefit in taking the slow road to Mars, which is the free return trajectory. If the crew decide not to capture into Mars orbit, they can slingshot around the planet and be back at Earth 2 years later, without minimal or no propulsive burns. This is a valuable abort option to have, especially for the first few human missions. If the flight to Mars is much quicker, a free return abort option will not be available. Other exotic propulsion methods such as ion propulsion, VASIMR (VAriable Specific Impulse Magnetoplasma Rocket), plasma thrusters, SEP, NEP, field propulsion, etc., are not currently under consideration for use in Blue Dragon, as they are speculative or still in development, are not needed, and their inclusion may introduce delays. However, when new propulsions technologies become available that are superior in terms of cost, safety and performance, they should certainly be considered. Highest specific impulse for liquid bipropellant (~450 seconds). Available throughout the Solar System, and, indeed, the Universe. However, for Adeona, or indeed any Mars mission, LOX/LH2 is probably not the ideal choice as it has a number of nontrivial drawbacks. LH2 is notoriously difficult to store for long periods, especially in the vacuum of space. Because of the very small molecule size, it tends to leak away, or “boils off”. Even with a boil-off rate of only 1%, it would still be necessary for Adeona arrive at Mars with a surplus of at least 20% of the fuel needed for TEI. Note, however, that zero boil-off tanks and densified liquid hydrogen have been developed to address this problem. LH2 has very low density (71 kg/m3 compared with 424 kg/m3 for LCH4 or 810 kg/m3 for RP-1), and therefore requires larger storage tanks compared with other fuels. The tank size becomes yet larger when accounting for the boil-off margin. Larger tanks are obviously heavier, and thus more expensive to launch. LH2 is highly cryogenic, with a boiling point of just 20 K, and therefore requires active cooling. This additional power requirement means additional mass for solar panels or other power system hardware, thereby further increasing IMLEO and launch costs. The need for active cooling means that LH2 is not generally considered space storable. This makes it unsuitable for Adeona, which must wait 1.5 years on Mars orbit. Because LH2 must be stored at such low temperatures, its tank must be kept separate from the LOX tank, otherwise the LOX could freeze. This increases the mass of tankage and other parts of the propellant system. LH2 causes metal to become brittle, which means associated engines and tankage require advanced metallurgy. This also drives up the cost of the vehicle. LH2 is more expensive than either RP-1 or LCH4. LH2 is highly explosive and difficult to work with, and can cause invisible high-temperature fires. Because of its low temperature, LH2 fuel lines can only be purged with expensive helium. These drawbacks arguably outweigh any advantages of LH2 attributable to its high Isp. 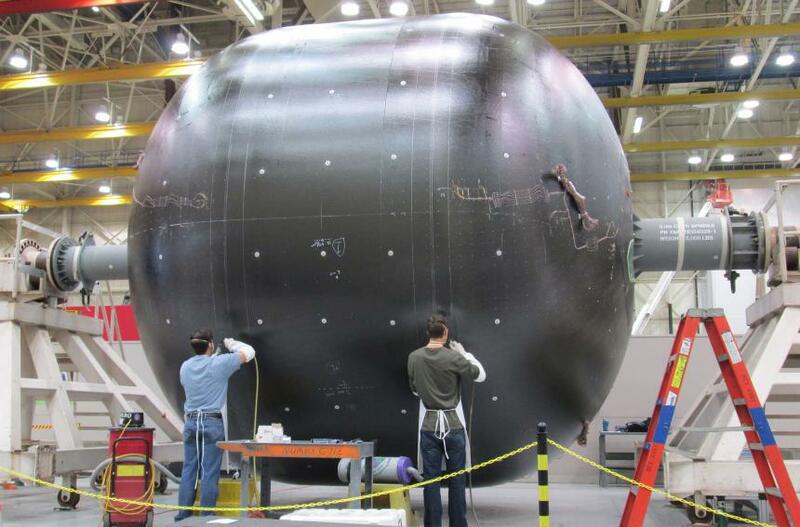 Advancements such as the new composite cryotanks developed by Boeing and NASA may produce strong, lightweight LH2 tanks that greatly reduce boil-off rates, possibly to zero when combined with MLI (Multi-Layer Insulation). However, even if this technology becomes available, considering the other disadvantages of hydrogen there is probably a better choice for MTV propellant. Instead of LOX/LH2, a more suitable option is almost certainly methalox. As settlement of Mars and the Solar System progresses, methalox engines may become increasingly common, at least while chemical propulsion remains economical. Availability, low cost, and potential for ISPP. Methane and oxygen can easily be obtained or manufactured from resources abundantly available throughout the Universe. On Earth, methane can be obtained directly from natural gas, of which it is the major constituent, and oxygen can be obtained directly from the atmosphere. On Mars, both can be manufactured from readily available CO2 and H2O. C-type asteroids, which comprise about 75% of known asteroids, contain abundant carbon and water from which methalox can be manufactured. On Titan it rains methane; there are lakes of the stuff. Long range exploration and settlement of the Solar System will be greatly enhanced by vehicles that can refill with propellant from resources discovered along the way. Commonality of hardware elements. Methalox is favoured for Mars ascent due to the potential for manufacturing it from local Martian resources. It could therefore be advantageous to use the same propellant for other manoeuvres, such as Earth ascent, Mars descent, the MTV, and surface vehicles. Methalox is suitable for launch as well as interplanetary and surface vehicles. If the same propellant is used in multiple applications, redundancy becomes automatically built into the knowledge base. Engines will be similar, parts counts and cost will be reduced, reliability increased, and propellant can be transferred from one application to another, thus improving propellant security. Propulsion engineers working on different vehicles using similar engines will be able to share expertise and innovations, resulting in greater synergy and problem-solving capability, and more rapid evolution of methalox engine technology. If methalox engines become more common, and are studied by more people, new ways to optimise and improve them will emerge. Non-toxic. This, in addition to other factors, reduces ground-handling costs and makes it considerably easier to get permits for engine testing. Cryotank design. By controlling pressures, LOX and LCH4 can be stored at a common temperature. 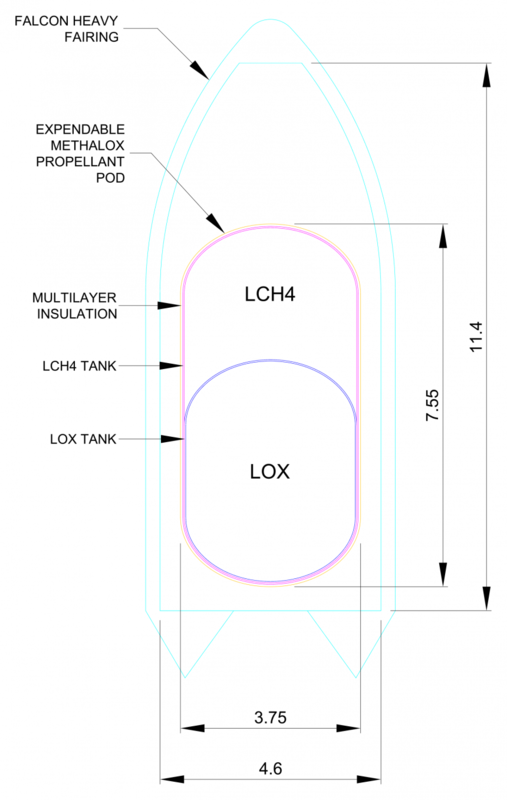 In fact, the LOX tank can be nested inside the LCH4 tank, with the tanks thermally coupled so that only the LOX tank requires cryocooling (Grayson, Hand & Cady 2009). This reduces the total volume required for tankage within the vehicle, and the mass of tanks, cryocooling systems, insulation and superstructure. Pump design. The volume ratio between is LOX and LCH4 is about 1.3, or nearly equal. The similar temperatures and volume flow rates mean that centrifugal pumps can be used with almost identical requirements, and could perhaps be run off a single spindle. This simplifies pump design, further reducing mass. can be run less O2-rich, which is easier on the pumps. has a higher boiling point, which means fuel lines can be purged with ordinary gaseous nitrogen. One feature of LCH4 is that it requires an ignition source to initiate combustion. This can be viewed as another advantage over LH2 the sense that LCH4 can be kept in close proximity to LOX without risk of exploding. It may also be considered a disadvantage because ignition can be difficult at low temperatures. However, it should be well within the capabilities of 21st century engineers to design methalox engines capable of reliable ignition, including restart capability, at Martian and deep space temperatures. In the DRA, the mass of the MTV is reduced en route by jettisoning pieces of the spacecraft that are no longer needed, such as propellant tanks and engines. This is worthwhile because, the lighter the vehicle, the less propellant is required to move it. Any reduction in mass at any point in the journey will translate to an appreciable reduction in propellant requirements, which, in turn, can mean millions of dollars saved. A spacecraft’s cruise stages comprise the engines, propellant tanks and associated hardware required for interplanetary propulsion, often attached to a long, rigid truss-like structure. Some interplanetary spacecraft designs include only one cruise stage, whereas others have multiple. As with rockets, one benefit of having multiple stages is that, as each fulfils its purpose, it’s discarded in order to shed mass and thereby decrease the propellant required for the next manoeuvre. The net effect is an overall reduction in IMLEO and therefore cost. However, IMLEO is not the only consideration and there are a variety of trade-offs that need to be considered. Each engine in this design is an RL10B-2, which is a LOX/LH2 rocket engine developed by Aerojet Rocketdyne. Rather than discarding stages to reduce mass, another approach is to discard propellant tanks that are empty and no longer required. This reduces the mass of the vehicle en route, without the loss of engines or superstructure. This is the approach taken in the DRA with the NTR design. One large LH2 fuel tank (the “drop tank”) is discarded after the major TMI burn in order to reduce mass, as shown in the bat chart below. The advantage of drop tanks for a reusable MTV is that replacing them once back in Earth orbit would be inexpensive compared with replacing superstructure, engines or entire stages. This use of drop tanks may therefore also be a good idea for Adeona, and may also suggest a simple and effective mechanism for initial filling and subsequent refilling of the vehicle with propellant. Propellant must be transported to Earth orbit in tanks anyway. Considering the difficult in on-orbit transfer of cryogenic propellant, it may be simpler and more efficient to deliver entire tanks and plug them directly into the MTV. Each is jettisoned when empty, reducing Adeona’s mass by about 1.5 tonnes. They obviate the need for in-space cryogenic propellant transfer. The entire tank is transferred from the delivery vehicle (Falcon Heavy) to Adeona. They enable the vehicle to be refilled with propellant at reasonably low cost using reusable rockets. MLI (Multilayer Insulation) surrounding the tanks. The EMPP is actually a small spacecraft. Not shown in the diagram is a simple GNC and OMS (Orbital Manoeuvring System) necessary for docking the pods. The battery-powered electronics would only need to operate for a few minutes. Each pod will locate Adeona via radio, orient itself automatically, and guide itself into its allocated pod bay, where external sockets on the pod will plug into Adeona’s propellant lines. The OMS thrusters would be fuelled by a small quantity of methalox from the main tanks. The propellant pod design shown above combines two recent innovations in propellant tank technology: composite cryotanks, and thermally-coupled nested methalox tanks. Cryotanks made of composite materials, such as those developed recently by Boeing and NASA, will be ideal for the MTV as well as the MAV. These mass about 70% of traditional metal tanks, with a specific weight of approximately 8.3 kg/m2. Engineers at Boeing have also invented a thermally coupled LOX/LCH4 tank (Grayson, Hand & Cady 2009), which substantially reduces the overall mass of cryocooling systems and insulation. This is made possible because, unlike LH2, LCH4 can be stored at the same temperature as LOX. Only the LOX tank is cryocooled. 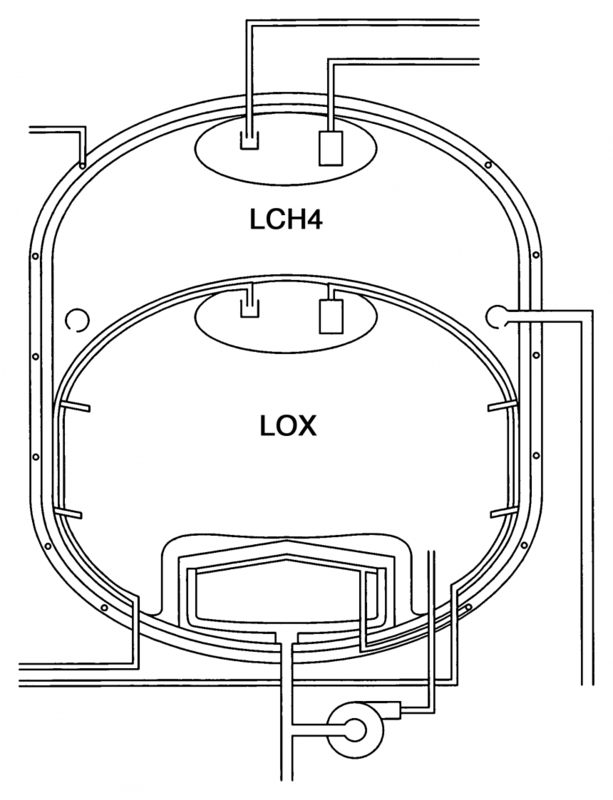 The LCH4 is cooled passively by heat transfer through the common tank wall. By controlling pressures, both tanks can be kept at a common temperature of 91 K.
Further mass savings are gained by the optimised geometry of the tanks, which reduces the mass of insulation and superstructure. As described in the Resources section, Adeona must depart Earth with a minimum supply of 1564 kg of water plus 3319 kg of food (dry mass), which is a total of 4883 kg. However, prior to TEI propulsion burn for the return home, any surplus contingency food and water, plus any unrecyclable waste generated during the mission so far, will be jettisoned in order to reduce mass as much as possible. This is the sum total of any remaining contingency food and water, plus dry metabolic waste products (extracted from urine, faeces and sweat), generated during the space element up to that point. In addition, at least a tonne of additional solid waste, including food packaging, toilet paper, sanitary napkins, medical waste, inedible biomass, etc., will also have been generated and can be jettisoned prior to TEI. However, this is not included in the basic calculations presented here. It’s worth noting that propellant can be optimised even further by jettisoning accumulated waste before MOI and EOI. Adeona’s methalox engines are currently envisaged as having a thrust of approximately 1.75 MN. While it would be congruent to use a COTS engine, no methalox rocket engines are currently in active use, and none of this size have ever been developed (although concepts have been proposed). Therefore, a new engine will need to be developed. SpaceX is currently developing a large new methalox engine called “Raptor”, which will power the second and upper stage of the Falcon 9 and Falcon Heavy rockets, and its 10 metre-diameter Mars Colonial Transport vehicle. Based on SpaceX’s track record, this will probably be quite a good engine with an efficient design, and at least partly 3D printed, like SpaceX’s SuperDraco engine. It’s Isp is expected to be 380 s, which is high for a methalox engine. However, with a vacuum thrust of 8.2 MN, this engine is too large for the MTV. A lower thrust per engine is preferable in order to control g-forces experienced by the crew. Blue Origin, in collaboration with ULA, are also developing a new methalox engine, with a thrust of about 2.4 MN. While this is a better match, it may still be too large for the MTV design described here, although could perhaps be suitable if the engine can be throttled. If so, this would result in significant savings in development costs, plus the fact that only three engines per MTV would be required. The estimated Isp of the new engine is also 380 s, which should be achievable. Assuming a conservative TWR (Thrust-to-Weight Ratio) of 100, each engine will mass about 1835 kg each. Five are required, for a total engine mass of around 9175 kg. The number of engines used for each manoeuvre is determined by Adeona’s maximum acceleration, which is kept below 4 g’s for crew comfort and health, and so they can still reach the controls. The design outlined here is simplistic, does not represent a complete or optimised design, and is offered purely to communicate a few ideas and hopefully to stimulate further creativity and discussion from sufficiently motivated allies. It will be cheaper, easier and quicker to develop better chemical rocket engines, and to launch a large quantity of propellant to LEO, that to develop entirely new propulsion technologies. COTS components such as inflatable habitats with adequate radiation shielding (e.g. the B330) and reusable rockets (e.g. the Falcon Heavy) will be available. An HLLV (Heavy Lift Launch Vehicle) — currently assumed to be the SLS, although other candidates may emerge — will be available for launching sections of Adeona. 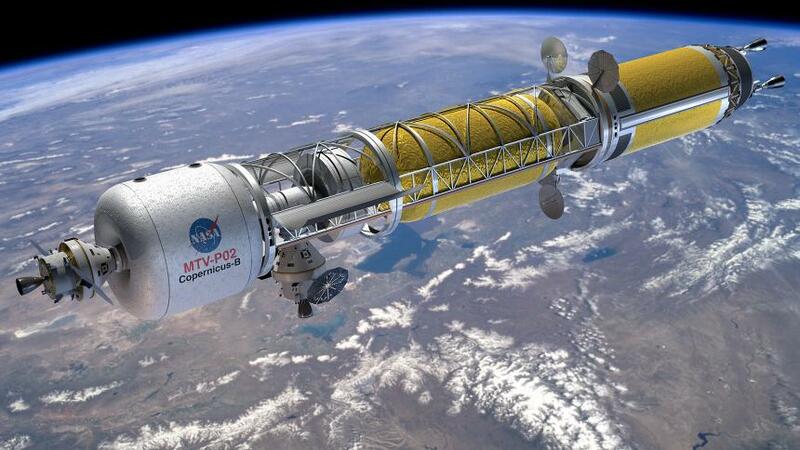 Cryogenic propellant tanks will be manufactured from composite materials rather than metals. Structural materials will become significantly lighter. Almost fully reusable spacecraft. Only the propellant pods are jettisoned. Fly from LEO to HEMO and back. As in the DRA, no aerobraking, aerocapture, artificial gravity, SEP tugs, propellant depots, Lagrange Points or gravity assists are utilised in the trip to Mars and back. The THAB, with a docking port for a Dragon capsule. Solar panels and thermal radiators. A long structural truss-like section. 10 EMPPs (Expendable Methalox Propellant Pods). Five 1.75 MN restartable methalox rocket engines. A full run-through of the trip to Mars and back is described below to help explain the benefits of the EMPPs and how Adeona’s mass is optimised during the journey. The first six EMPPs are used for the climb from LEO (nominally 400 km circular) to HEEO (nominally 400 km x 100,000 km). The climb is achieved with a series of six “perigee kicks”, making best use of the Oberth effect. One entire pod of methalox (about 51.5 tonnes) is burned each time Adeona passes through perigee, then the empty pod is jettisoned. This minimises the mass of the vehicle for each burn, thus maximising Δv and the altitude reached. 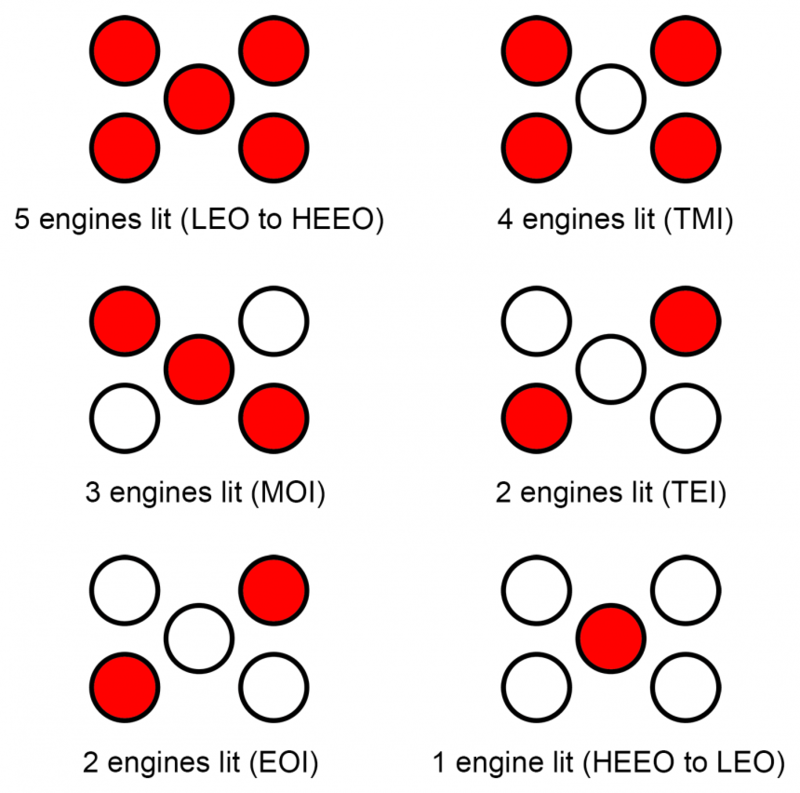 Apart from the fact that the EMPPs provide a much cheaper and more practical way to supply Adeona with propellant, this technique also efficiently reduces the total propellant requirement for TMI compared with doing one massive burn out of LEO. The total Δv achieved during the climb is about 2.8 km/s, and if completed in six successive orbits, will take about 2.5 sols. Two manoeuvres are required to travel from HEEO to HEMO. Adeona performs TMI from the HEEO, and flies to Mars along an elliptical orbit for 175 sols. When close to Mars, the MOI burn is performed, with Adeona capturing into HEMO with periareon at about 250 km altitude and apoareon at about 33,850 km altitude. 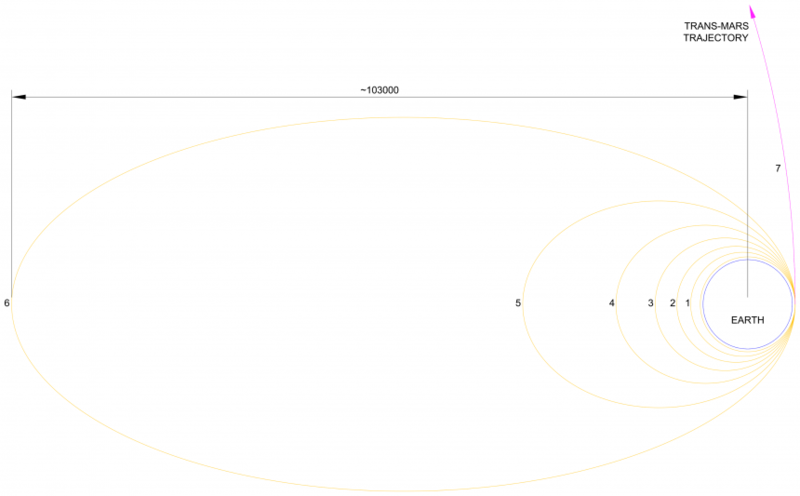 This orbit has a period of 1 sol and is therefore often referred to as a 250 km x 1 sol orbit*. This particular orbit is also used by other Mars mission architectures, as it offers the benefits of being much easier to reach than LMO (Low Mars Orbit), and is synchronous with the base location, passing overhead once per sol. After MOI, Adeona jettisons the 7th empty EMPP. The crew descend to Mars in the Blue Dragon capsule, further lightening the vehicle by about 5.2 tonnes. Adeona then waits in this 250 km x 1 sol parking orbit for 535 sols while the crew do their thing on Mars. * In the DRA, the parking orbit at Mars is 250 km x 33,793 km. The different apoaerion altitude is due to the inclination of the orbit and the fact that Mars’ radius decreases slightly with increasing latitude. The important thing is not the precise altitude of apoaerion, but the 1-sol period. At the end of the surface mission, the crew ascend to Adeona’s parking orbit, and Kepler docks with the THAB. The crew transfer into the THAB, and Kepler is jettisoned. About 6.7 tonnes of contingency food and water is also jettisoned, being no longer needed. This makes the vehicle as light as possible prior to the TEI burn. After TEI, the 8th propellant pod is jettisoned, and the crew enjoy a relaxing 6-month flight back to their home planet, satisfied in a job well done and thankful for the rest. On arrival at Earth, Adeona performs EOI into HEEO, then jettisons the 9th propellant pod. The final manoeuvre is straight back into LEO. Although this is a large Δv manoeuvre (around 2.7 km/s), there’s no need to “climb down into LEO” as such, because now the vehicle is comparatively very light, and only one propellant pod is needed. Adeona parks back in the assembly orbit with one EMPP remaining, which may contain a few leftover tonnes of contingency propellant, depending on how accurate the various manoeuvres have been throughout the mission. As it cannot be refilled on orbit, this EMPP must also be jettisoned. Ideally it will be reclaimed and reused. A Falcon 9 is launched from Earth with Newton, an empty Crew Dragon capsule, to rendezvous with Adeona and pick up the crew. It has been about 30 months since Adeona left LEO. She now waits patiently in LEO for approximately 22 more months before her next departure. During this time, several missions to Adeona are conducted, at least some of which involve EVA and full inspection of the vehicle by astronaut engineers. The THAB is cleaned and tidied. Adeona is then refilled with propellant in the form of 10 fresh EMPPs, launched by reusable Falcon Heavy rockets, before receiving the next crew and setting off again for Mars. This section is included purely for people interested in the calculations underlying this design. Other readers may wish to skip ahead. The values into and out of “Earth-Mars Transfer”, a.k.a. 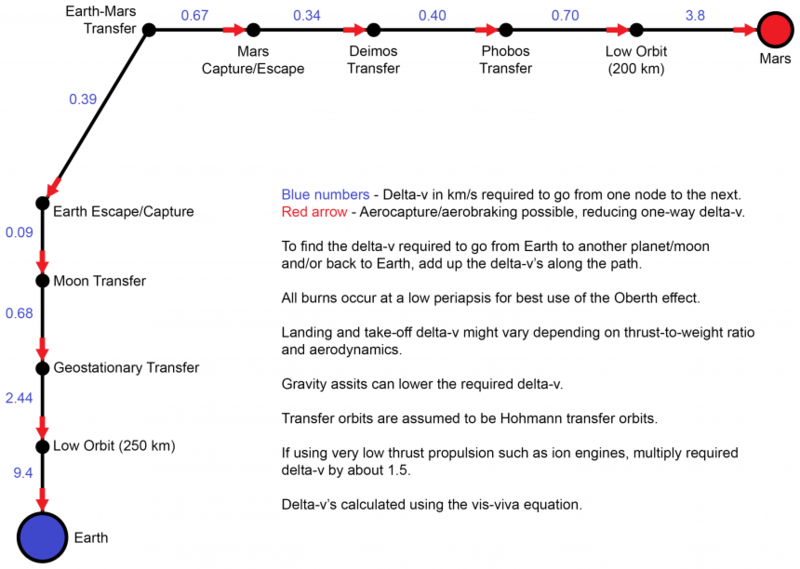 Mars Transfer Orbit, will vary according to the speed of the orbit and thus the trip times, and these values may well be a little low. However, they should suffice for a first-order analysis. Mass estimates follow — all values are in kilograms. The mass of the 5 engines is determined from a nominal TWR of 100 for a 1.8 MN engine, which gives each engine a mass of around 1835 kg. This structure mass may seem light, but advanced materials such as Ti-C composites are assumed. Miscellaneous masses such as navigation systems, RCS, propellant lines, pumps, thermal paint, etc., have not yet been accounted for as yet. Some elements will already be included in the THAB. A Falcon Heavy can deliver 53 tonnes to LEO. As the goal is to transport as much propellant to LEO as possible with each launch, the mass of a full EMPP matches this payload capacity. *“Dry mass” refers to the mass of a spacecraft without propellant; “wet mass” refers to the mass of a spacecraft with propellant. The estimated mass of the tanks is calculated from 8.3 kg/m2, matching the recently developed composite cryotanks. The inner LOX tank surface area is about 56 m2, and the outer LCH4 tank surface area is about 89 m2. The estimated mass of the MLI is calculated from an estimated 50 mm thick layer of double-aluminised Mylar with Dacron net spacer, with a bulk density of about 50 kg/m3. The 100 kg for GNC/RCS/miscellaneous is a guess. The world average mass of 62 kg for a human adult is used to estimate crew mass. Even though astronauts typically come from countries where adults have a higher-than-average mass, astronauts also tend to be fitter and lighter than the average. According to Dava Newman, BioSuits are projected to have a mass of 20 kg each. In addition, each crew member is allocated an estimated 20 kg allowance for their individual kit bags. Admittedly, both these figures may turn out to be on the low side; however, note that these items must travel with the crew in capsules during Earth/Mars ascent and descent, and hence their mass and volume must be fairly restricted. The 5200 kg mass of Einstein is based on an estimated 3300 kg for a Dragon V2 capsule without a trunk, plus 1900 kg of NTO/MMH propellant for landing on Mars (Grover et al. 2012). As discussed in Food Mass Estimates, approximately 3742 kg of surplus contingency food and water, and waste, is jettisoned prior to TEI. Adeona is assembled in LEO at an “assembly orbit”, which is nominally a circular orbit with an altitude of 400 km, i.e. basically the same as the ISS. This orbit is chosen mainly due to the extensive experience that has been gained by international space agencies operating at this orbit, including on-orbit assembly, and for proximity to the ISS in case it can provide support to the MTV, or in case it could be useful to connect Adeona to the ISS for training purposes or to aid with construction. However, as none of these things are strictly necessary, an alternative assembly orbit may be considered if there are advantages. 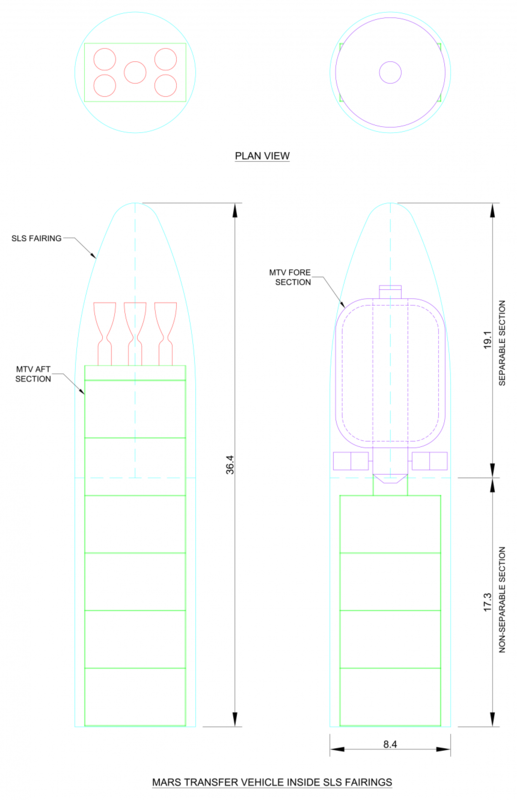 Adeona is launched as two separate sections, each of which fits inside the payload fairing of an SLS 105t Cargo. The solar panels and radiator arrays (not shown) are folded up to fit inside the fairing, or may be attached separately. In Mars Direct, on-orbit assembly is presented as a drawback because of the additional cost and risk involved. However, without on-orbit assembly, the MTV must be much smaller, which would translate to less living volume, no potential for reuse of the vehicle, and perhaps a more expensive, or harder-to-develop propulsion system. On-orbit assembly enables the construction of a more capable, comfortable, and reusable vehicle, which can probably be available sooner and will cost less over the course of the IMRS program. Although it adds some additional cost and complexity to the architecture, on-orbit assembly is hardly beyond current space engineering capabilities. The ISS was assembled in LEO, and was considerably more complex than Adeona will be. It’s true that the Space Shuttle, which was a key element in ISS construction, will not be available, but recall that the Apollo LEM and command modules were docked on orbit without the benefit of the Space Shuttle. The payload capacity of the SLS 105t is ample, since, without the methalox propellant pods, Adeona’s dry mass, excluding the EMPPs but including THAB fittings plus all food and water for the space element, is under 50 tonnes. In fact, it may be possible to launch each half with one full propellant pod already loaded. As shown above, the payload fairing of the SLS 105t has a diameter of 8.4 metres and a total length of 36.4 metres, comprised of a 17.3-metre lower non-separable section and a 19.1-metre upper separable section. The 105t may be the smallest SLS with a cargo mode, but if an SLS 70t can be configured for this payload fairing then it might be a better choice, since it will be cheaper than the 105t, and its capacity of 70 tonnes to LEO is still way more than enough. The primary drawback of an MTV based on methalox is the large amount of propellant required to get to Mars and back, which makes the vehicle large and expensive. However, the total propellant requirement could potentially be reduced through a variety of strategies. It may be possible to use aerobraking at Mars and Earth to reduce Adeona’s velocity, rather than relying on propulsion alone. Aerocapture is when a spacecraft flies through the top of the atmosphere from an inbound transfer orbit, capturing it into an elliptical orbit. Aerobraking is when the spacecraft flies through the top of the atmosphere at periapsis of an elliptical orbit in order to reduce the eccentricity of the orbit; the opposite effect of a perigee burn. The primary disadvantage of aerobraking and aerocapture is that the spacecraft requires some protection from the heat generated due to friction. As the spacecraft’s velocity decreases, its kinetic energy is converted to heat. If the speed reduction is to be significant, then the heat generated will be proportionally significant. Thermal protection can be in the form of a heat shield, or a coating of ablative material. An ablative material would almost certainly be non-renewable, which would affect the reusability of the spacecraft. In addition, it’s difficult to imagine how a vehicle shaped like the MTV could be coated in such a material. A heat shield has the advantage that it would also provide protection from atmospheric drag forces that could damage solar panels, radiators, antennas and other exposed equipment. However, for a spacecraft with a diameter of 6.7 metres (~15 metres if counting the full extent of the solar panels and thermal radiators) an inflatable heat shield would mass at least 5-10 tonnes. This additional mass would increase the propellant requirement, counteracting any potential savings achieved by using aerobraking. Assuming, therefore, that Adeona does not carry a heat shield, she would not be able to go very deep into the atmosphere. She could potentially fly through the very tops of the atmosphere without thermal protection, and without overheating, but the effect on her speed would be minimal. Aerocapture would therefore not be applicable to Adeona, because this must be achieved in a single manoeuvre. Aerobraking, however, can gradually lower an orbit over a long period by slowing the spacecraft down each time it passes through the atmosphere at periapsis. Because the change in velocity each orbit during aerobraking will be small, it could take months to lower the spacecraft’s apoapsis to the desired altitude, which would seem to conflict with the goal of minimising the amount of time that the crew is in space. However, if a Dragon capsule can descend from a higher orbit without imposing excessive deceleration forces on the crew, they won’t actually need to be onboard during this process. Thus, on approach to Mars, Adeona could capture into a very highly elliptical orbit around Mars, and the crew could descend to Mars from this orbit. Then, during the 1.5 years that the crew is on Mars, Adeona could use aerobraking to gradually reduce her orbit to the target 250 km x 1 sol parking orbit. This strategy could be effective in reducing the overall propellant required for MOI. The same technique could be applied at Earth. Instead of requiring Adeona to return all the way to LEO, it would be sufficient to reach the highest possible elliptical orbit that can be reached by Newton. A Falcon 9 can deliver 13,150 kg to LEO, whereas a Dragon capsule wet mass is only 5490 kg, which means Newton could rendezvous with Adeona at an orbit much higher than LEO. Newton should be able to safely descend from this orbit without the crew experiencing significant g-forces; especially compared with Mars Direct and the DRA, in which the crew vehicle enters Earth’s atmosphere directly. After the crew have descended to Earth, Adeona’s orbit could then be gradually reduced to LEO using aerobraking over a period of months. There are approximately 22 months between the arrival of the Adeona back at Earth and its next departure for Mars — ample time for this process. Astrophysicists refer to the “Interplanetary Transport Network” (ITN), a collection of gravitationally-determined pathways through the Solar System that require minimum energy for a spacecraft to follow. Because the objects in our Solar System are constantly moving in relation to each other, these pathways are always changing. The relative positions and velocities of Earth, Mars, the Sun, the Moon, Phobos, Deimos, and perhaps even Jupiter, must be considered when calculating the optimal plan for when and where to burn propellant in order to most efficiently reach Mars and return safely back. A related approach known as ballistic capture is a method of reaching Mars whereby the spacecraft flies to Mars orbit ahead of the planet and waits for Mars to catch up. This is estimated to be capable of reducing the amount of propellant required by as much as 25%; however, it significantly increases the duration of the trip, which is undesirable for the crew, although it could be acceptable for cargo. Also, the spacecraft is captured into a fairly high orbit, and an additional burn is still needed to reach LMO or the surface of Mars. Predeployed assets could fly to Mars on minimum-energy Hohmann orbits, or make use of ballistic capture, as predeployed assets can take longer to get to Mars. These low-energy pathways would probably only be considered for crews in the event of breakthroughs in radiation shielding, artificial gravity, or healing/preventing the deleterious effects of microgravity. Even when the space environment is made safer, these options may not have much appeal for crew transfer, and it’s more likely that technological advancements will be applied to reduce trip times. After all, the goal is not to be in space, but on Mars (or wherever the destination may be). Mission designers will most likely seek to reduce the amount of time crews spend in space as much as possible. Because the sections of Adeona to be launched by SLS weigh much less than the capacity of those vehicles (about 25 tonnes each compared with the 70 tonne capacity of SLS 70t), a more efficient approach could be to assemble Adeona at a higher altitude. The trade-off would be smaller EMPPs, since, if a Falcon Heavy can launch 53 tonnes to LEO, then the amount it can launch to a higher orbit will be less (e.g. it can only deliver 21 tonnes to GTO). This could mean additional propellant launches, or it could mean fewer, since Adeona will require less propellant for TMI if starting from a higher orbit. Further analysis is necessary to determine the optimal orbit for assembly and propellant loading. An SEP tug could be used to gradually pull Adeona from LEO to HEEO prior to TMI, and back down from HEEO to LEO after capture into Earth orbit. This could eliminate a significant fraction of the propellant — perhaps as much as half. SEP engines have very high Isp, but very low thrust, which means this part of the trip would be very slow; however, the crew do not need to be aboard during this time. Adeona could be constructed and filled with propellant on LEO, requiring only one launch for the vehicle, and perhaps 5-6 for EMPPs. The tug would tow Adeona to the higher orbit over a period of weeks or months, traversing a series of increasingly elliptical Earth orbits until the desired apogee was reached. It would then disconnect from Adeona and begin a steady process of descending back to LEO in preparation for the next mission. The crew would launch in a Dragon capsule and rendezvous with Adeona at perigee. The maximum altitude of the HEEO will be determined by the capabilities of the Falcon 9. 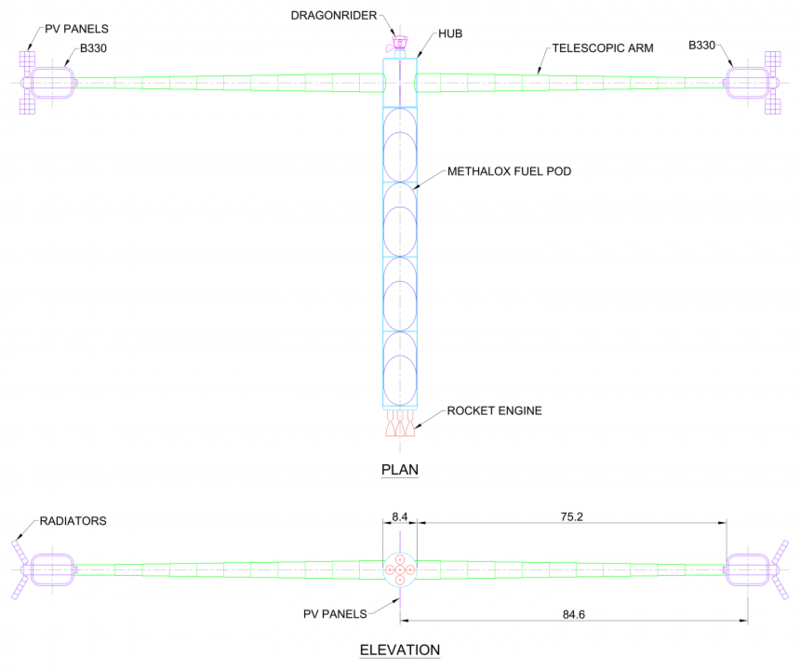 The Falcon 9 is capable of delivering a payload of 4850 kg to GTO, and the wet mass of a crewed Dragon with a payload of 6 crew in marssuits is about 6 tonnes (although this will vary due to the modifications necessary for Mars descent), suggesting a rendezvous orbit somewhere below GTO. On return to Earth, Adeona would again capture into the highest possible HEEO that can be reached by Newton, and the crew would descend to Earth from there. The SEP tug would rendezvous with Adeona and gradually pull it back to LEO during the subsequent months. This idea may seem appealing due to the huge savings in propellant and associated launch costs, but the expense of developing, constructing and operating the SEP tug could potentially dwarf any cost savings due to propellant reduction. Nonetheless, SEP tugs in Earth orbit could potentially serve a multitude of uses over the coming years, as humanity expands into space, and should perhaps be developed anyway. In the basic design for Adeona presented, 6 of the 10 EMPPs are used purely to raise its orbit out of LEO. The vehicle that flies to Mars is therefore about twice as long and somewhat heavier than it needs to be. It isn’t massively heavier, because the six empty EMPPs have been jettisoned, and the structure mass is kept low by using composite and/or nanostructured materials. Nonetheless, it would be worthwhile to analyse how a two-stage vehicle would compare in terms of overall cost and performance. The first stage would likely have 5-7 EMPPs and five engines, and would serve to raise Adeona’s orbit from the 400 km circular assembly orbit to a HEEO with an apogee somewhere in the range of 100,000-200,000 km. At this point stage separation would occur. The second stage would be comprised of the THAB, 3-4 EMPPs and three engines, which should be sufficient to fly to Mars and back. For this design to be superior then there must be a reduction in propellant and both stages of the vehicle would have to be reusable. The first stage, having separated, could possibly lower its orbit via aerobraking over the subsequent months after stage separation, until it again reaches the assembly orbit. After inspection, it would then wait on orbit until the return of the second stage, where they would be reconnected, and the vehicle refilled with propellant in preparation for the next mission. If the only advantage of this design over the single-stage version is perhaps 1-2 fewer EMPPs and the associated Falcon Heavy launches, saving perhaps $20 million at the most, then it’s questionable whether it would be worth the additional complexity, both in the overall architecture, and in development and fabrication of the vehicle. However, a more detailed study of this idea could be fruitful. To get maximum value from the propellant it should be burned when the spacecraft is moving fastest, as this will produce the greatest increase in the spacecraft’s velocity. This is known as the Oberth effect. The higher the spacecraft’s velocity during a burn, the more kinetic energy will be transferred to the spacecraft and the less to the propellant. If the spacecraft is in an elliptical orbit then the best time to burn the propellant is at periapsis, because this is when it’s moving fastest. In this way, less propellant is required to achieve a given ∆v. The ∆v map on which the above design is based already incorporates the Oberth effect. However, such maps are only approximate, as are the resulting calculations, and there is always room for optimisation. Delta-v maps and the technique of “patching conics” (adding and subtracting ∆v quantities in order to determine net ∆v for spacecraft manoeuvres) are an approximation based on simplified two-body mechanics and well-understood Keplerian physics. This is fine for back-of-the-envelope calculations, however, there are actually millions of objects in our Solar System, all affecting each other gravitationally in a complex n-body system for which the mathematics are significantly more complex. Specialised trajectory analysis software that takes into account the Oberth effect, gravitational effects of multiple planets and moons, Lagrange Points, low energy pathways such as ITN and ballistic capture, and other factors, is necessary to identify the optimal times, places, angles and quantities for propellant combustion in order to minimise the overall requirement within the parameters of the mission. 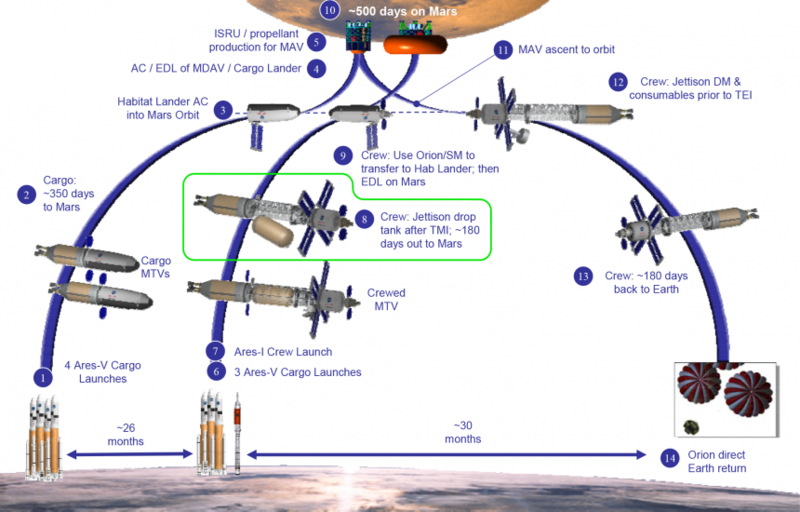 A trip to Mars based on a long-stay, or conjunction-class, mission profile using ordinary chemical propulsion involves approximately a year in space: 6 months outbound and approximately the same duration on the return leg. A short-stay mission requires around 20 months total in space. Either way, this is a significant amount of time to spend in a microgravity environment. Only two people, both Russians, have spent more than 1 year in space: Valeri Polyakov, who achieved 438 days in 1994-5, and Sergei Avdeyev, who achieved 380 days in 1998-9. Therefore, only a small amount of data has been collected about such long-term exposure to microgravity, and much of it is more than a decade old. Although a variety of techniques for mitigating the adverse effects of microgravity have been developed during the past decade, minimal data is available about spending a year or more in microgravity during which astronauts had access to these measures. In addition to a year in space, the crew spends 1.5 years on the surface of Mars, which is also a reduced gravity environment (0.38 g). Living on Mars surface will reduce the load on the body by 62% and is therefore likely to have effects proportionally similar to microgravity. The primary concern is that the crew will spend approximately 6 months in microgravity during the outbound trip, arrive at Mars surface, and be incapable of useful work. Blue Dragon requires the crew to transfer from a landing capsule to the CAMPER on arrival, and then to SHAB, so it’s even more critical that they be able-bodied on landing. An almost equally important concern is that the crew will return to Earth after 2.5 years in reduced gravity environments and be unable to recover. Apart from the undesirable effects on beloved interplanetary explorers and heroes, such an outcome would hardly add to the glory of space exploration and may become a deterrent to future human exploration and settlement. The problem of microgravity in an HMM is hardly a minor one. Along with the health effects of radiation in interplanetary space, it’s considered by many one of the main risks associated with sending humans to Mars. Because of these concerns, some Mars mission designers include AG (Artificial Gravity) in their architecture. The simplest way to create a gravity-like effect is with centrifugal force, which can be produced by spinning part or all of the spacecraft. Unfortunately centrifugal force is not a perfect substitute for actual gravity, and it’s not yet known for certain if it will be an adequate substitute. The DRA does not specify unequivocally whether AG should be used, although it does state that AG would be far more important for a short-stay, opposition-class mission due to the longer time spent in space. It is not considered essential for a conjunction-class mission, and the MTV designs in the DRA do not include support for AG. Adverse physiological changes due to reduced gravity may be prevented by exposure to some level of artificial gravity, but the specific level of gravity and the minimum effective duration of the exposure that is necessary to prevent deconditioning are not yet known. Although artificial gravity should reduce or eliminate the worst deconditioning effects of living in zero gravity, rotating environments frequently cause undesirable side effects, including disorientation, nausea, fatigue, and disturbances in mood and sleep patterns. If artificial gravity is to be employed, significant research must be done to determine appropriate rotation rates and durations for any artificial gravity countermeasures. The decision on whether artificial gravity must be employed to adequately support crews on their transits to and from Mars, as well as the decision on the necessary gravity level and rotation rate, has significant implications for vehicle design and operations. AG is therefore no panacea, and carries its own set of health-related problems. Research indicates that the negative effects of centrifugal force are largely unnoticeable if the rotation rate is maintained below a maximum of 2 rpm. To produce Earth gravity at this spin rate requires a radius of approximately 224 metres; to produce Mars gravity requires a radius of about 85 metres. The use of AG in Blue Dragon would significantly increase the cost of the mission due to additional mass of both spacecraft and propellant, and increased complexity of propulsion, navigation, communications and power systems. It introduces additional hazards and failure modes, and would significantly increase development costs. It would also compromise the interior design, as a spaceship designed for microgravity can be made more space efficient. Complexity, mass and cost need to be minimised, especially for early-stage HMMs. The question is whether the considerable cost associated with AG would produce sufficient ROI compared with a regimen of physical training, nutrition and medication. Artificial gravity is provided to the crew on the way out to Mars by tethering off the burnt out Ares upper stage and spinning up at 1 rpm. The habitat, which, in Mars Direct, is used for the outbound trip as well as surface habitation on Mars, is designed for a gravity environment: AG in space and Mars-g on Mars. It will therefore have a floor, ceiling and walls, with cupboards, screens, controls, etc. mainly on the walls. The result is a less compact and heavier spacecraft, or one with fewer fixtures/features. Although designed for a gravity environment, after launch the hab will be in microgravity until the AG is set up, which is not until after TMI, and must also return to microgravity mode after being spun down prior to MOI. In addition, if the AG system fails and the tether must be dropped for any reason, the hab must be able to continue to Mars in a microgravity mode. Designing the hab to be operable in both AG and microgravity modes will add complexity. Because the tether is not rigid there’s a risk the counterweight could crash into the hab, and it may not be possible to prevent this even by dropping the tether. The mass of the 1500-metre tether must also be launched, which means more mass, more propellant and more cost. Note that the tether must be strong enough to safely handle the tension produced by centrifugal force (equivalent to Mars gravity times the mass of the hab), plus a suitable safety margin. Communications with Earth are more challenging with a spinning spacecraft, as it’s more difficult to keep antennas pointed in the right direction without sacrificing signal strength. Communications with Mars are already up to one million times more challenging than with the Moon, since Mars is up to 1000 times as far away (signal strength decreases with the square of the distance). With a spinning spacecraft it’s more difficult for navigation sensors to track the position of Earth, the Moon and stars. Collecting solar energy with solar panels is more difficult and possibly less efficient, as they should ideally be always directly facing the Sun. The hab and the counterweight both require an RCS, which must work in tandem in order to produce a stable spin around a common centre of gravity, or for any course manoeuvres. This would require advanced avionics. RCSes, comprised of thrusters and propellant (i.e. mass), are required on both the hab and the counterweight, in order to spin the whole assembly up and then down again prior to MOI. Additional propellant is required to send, not just the hab, but also the counterweight, tether and associated systems on TMI. Course corrections and other manoeuvres are more difficult, as both the spacecraft and counterweight must be pushed in the same direction at the same time, without overstressing and breaking the tether, or causing it to stretch and rebound, or causing it to become slack. Plus, the dynamics of the spinning masses must also be accounted for. As the assembly approaches Mars it must be spun down and the tether dropped before MOI. This will put the spacecraft on a trajectory that is difficult to predict in advance with precision, making it more difficult to calculate, in advance, the required burn to place the spacecraft on the desired EDL trajectory. It may have to be re-calculated in real time, which is riskier. Yet the hab must hit the atmosphere at exactly the right angle and altitude. EDL is already a very technically challenging and dangerous process, and this additional factor would make it even more difficult. If the tether breaks for some reason (e.g. meteoroid impact, overstressed) en route, the hab and counterweight will fly off in opposite directions with a velocity component perpendicular to the desired trajectory. The hab would need additional propellant to make a course correction if this happens. In addition, MCC must be prepared to track and communicate with the hab (which may be on an unknown trajectory) and assist with on-the-fly calculations to determine course correction manoeuvres. Only Mars-level gravity is provided, which is still a reduced-gravity environment, and the crew will still experience adverse health effects to some degree. Also, the AG solution described in Mars Direct is only for the outbound trip. The crew may arrive at Mars adapted to Mars gravity, but on return to Earth will be in almost the same condition as if no AG was provided at all. Therefore, despite considerable additional expense and complexity, this strategy only goes about 19% (38% * 50%) towards addressing the problems of low gravity associated with a human mission to Mars. Some of these issues can be addressed by using a rigid telescopic truss instead of a tether, but that would have a high mass and therefore be an even more expensive solution (see Athena - a 12-person MTV with AG). The benefits of AG don’t warrant the cost and complexity of implementation, particularly for the first few missions, and it isn’t a necessity. Many astronauts have spent months in microgravity; on return to Earth, some are able to walk away from the spacecraft and some are not, but all recover and readapt to Earth gravity in time. The crew of an IMRS mission will be able to offset the deconditioning effects of microgravity by spending some time each sol doing exercise, either in Adeona’s gym or by going on EVA. Their diet will be high in protein and minerals. These results indicate that the use of an antiresorptive plus exercise may be effective during long-duration spaceflight and that bone measures at 1 year remain at or near baseline values. By incorporating modern physical training principles and equipment, and appropriate nutrition and pharmaceuticals, the crew should be fully able, even after spending 6 months in microgravity. On arrival at Mars it’s understood that the crew will need at least a few sols, perhaps even a week or so, to adapt to Mars gravity. This is a clear advantage of a long-stay architecture. As the crew has about 18 months on the surface, this comparatively brief recovery period will significantly not impact the surface mission. The astronauts will naturally be eager for EVA, and will push themselves to recover quickly. In fact, going EVA could be the most effective way for them to regain strength. Another reason why microgravity may be preferred to AG is simply that it’s more fun, which is good for morale, and for entertaining people back on Earth. 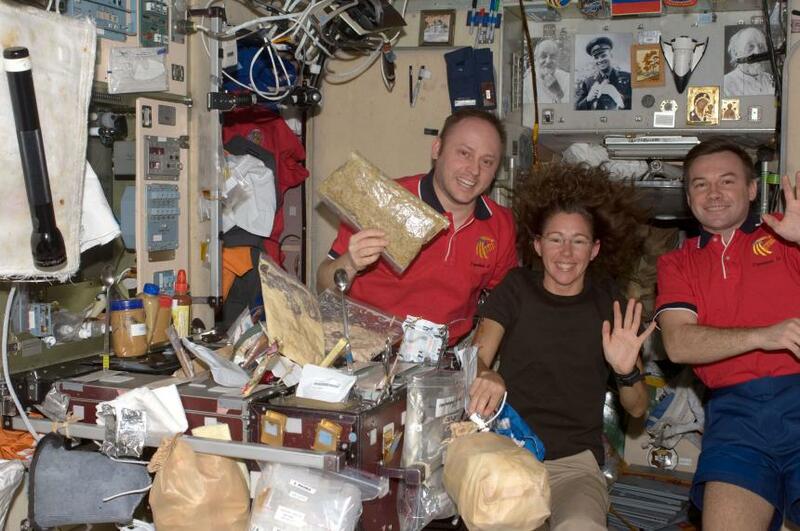 Microgravity is arguably half the fun of being in space, after all. The Inspiration Mars mission to send two people on a Mars flyby will require them to spend more than 1.5 years in microgravity. If successful, this mission will go a long way towards answering the question of whether it will safe to send a crew to Mars surface and back on a 2.5 year mission. Mars One also does not make use of AG. While not a complete antidote to the effects of microgravity, the most important strategy will be exercising every sol. The human body responds to loading. When it becomes unloaded — for example, by spending time in a reduced gravity environment — the body adapts by losing muscle and bone mass, simply because not as much is needed. When it is loaded — for example, by lifting weights several times per week — the body adapts by increasing muscle and bone mass. The amount of weight it’s loaded with. The more weight the body is loaded with, the more it will tend to grow stronger. The amount of time it’s loaded (also called “time under tension”). The more time the body spends loaded, the more it will be forced to adapt. Nutrition is a critical factor, especially protein. Protein should represent a significant fraction of the diet, as it protects against muscle catabolism and provides the building blocks (amino acids) to synthesise new muscle tissue for growth and repair. A balance of other nutrients is also essential: healthy fats, complex carbohydrates, vitamins, minerals and plenty of water. Strength training involves performing a range of exercises to train all the muscles in the body. But is there an exercise that simulates loading due to gravity? Yes, and this exercise is well-known to bodybuilders as being the number one exercise for loading almost the entire body: squats. Squats are known as the king of exercises because they build the full kinetic chain of the body. They’re a highly functional exercise, requiring the muscles used in standing, walking, jumping and running. Squats load the body in almost the same way as normal gravity — vertically downwards — but to a greater degree. Squats may yet be revealed as the number one exercise for reversing the deconditioning effects of microgravity. The intention for Blue Dragon is that the crew spends approximately 1 hour per sol doing strength training. Not only squats, because that would be a bit boring and would lead to over-training, but all the so-called “Big 5” exercises: squats, deadlifts, chest press, shoulder press and chin-ups. Spending only 4% of each sol with the body partially loaded may not seem like enough to offset the effects of microgravity. However, muscles do not need to be overloaded for long periods to stimulate growth, and many people achieve muscle growth with just 2-3 gym sessions per week. Regular, short periods of intense exercise are effective at improving strength and fitness. The intent behind resistance or strength training is usually muscle growth, fat loss or both. However, one of the major problems with microgravity is loss of bone density, and fortunately strength training helps with this, too. Research shows that resistance training produces noticeable increases in bone density, and is therefore sometimes recommended for osteoporosis sufferers. Other conditions that improve as a result of strength training include cardiovascular disease, diabetes and high blood pressure. Rather than lifting weights, which would be ineffective in microgravity, Adeona will be equipped with multi-functional hydraulic gym equipment. Plenty of commercial gym equipment based on hydraulics is available, which will work perfectly well in a microgravity environment. Something else that astronauts may be able to do in microgravity to stay fit is yoga, which produces a wide range of benefits for both body and mind. Although many yoga postures require gravity, particularly those related to balance, others could be adapted for a microgravity environment. Improved flexibility and breathing, cleansing the lymphatic system, releasing stress stored in the spine and muscles, and all the other benefits of yoga could potentially be gained by a Mars mission crew. Because it’s easier to push blood around the body without gravity, the heart doesn’t have to work as hard, which causes a decrease in heart mass. This can be mitigated by regular cardiovascular activity. The heart must be exercised like any other muscle, but it’s exercised differently, using cardiovascular exercise instead of resistance training. The heart rate must be elevated. Although this is achieved for intermittent periods with strength training, cardiovascular exercise serves to sustain an elevated heart rate for longer periods. While on Mars for 1.5 years, the crew will experience considerable additional exercise in the form of regular EVAs; up to about 32 hours per week. During this time they’ll be wearing a marssuit with a mass of approximately 20 kg. While this is not a heavy load, particularly in Mars gravity (where it will feel like just 7.6 kg), the astronauts will be performing a range of physical activities whilst wearing the suit, including hiking, bending, kneeling, standing, lifting and carrying. Although the gravity on Mars is reduced, inertia is unchanged, and muscles will be constantly activated while in the suit in order to maintain balance. Going on EVA could therefore be an important part of the necessary physical conditioning to mitigate bone and muscle atrophy. The astronauts will surely prefer going on EVA on Mars to doing squats in the hab. 3 sols per week: cardio. 3 sols per week: yoga in the morning, strength exercises in the afternoon. 4 sols per week: yoga in the morning, then EVA. 2 sols per week: cardio in the morning, strength exercises in the afternoon. 1 sol per week: rest. 30 minutes breathing meditation every day. Plenty of protein to minimise muscle loss and support muscle growth and repair. Plenty of minerals, especially calcium, magnesium and iron. Bisphosphonates to mitigate bone loss. Plenty of sleep and clean water. This MTV is named “Athena”, after the Greek goddess of wisdom, courage, inspiration, civilisation, law and justice, mathematics, strength, strategy, the arts, crafts, and skill. Athena is the companion of heroes and patron goddess of heroic endeavour. This design has two THABs based on B330 modules, and would support a crew of 12. At least two SHAB’s would therefore be needed at the IMRS to support crews of this size. Although this vehicle would be considerably more expensive than Adeona, expanding the missions to support larger crews may make them cheaper per astronaut, and the addition of AG will improve astronaut health. The central core of the vehicle, comprised of a central hub plus four large EMPPs (sized for the payload of the SLS or other SHLLV) would be built first. The two telescopic arms are designed to fit inside the payload fairing of the Falcon Heavy when collapsed. They would be launched by Falcon Heavy, connected to the central hub, and the B330 modules attached to their ends. The assembly would gradually be spun up to 2 rpm using the RCSes on the B330 modules, causing the arms to extend under the influence of centrifugal force. The joins between the sections of the arms would be bolted or clamped together (ideally automatically, but perhaps manually by astronauts on EVA) to form airtight tunnels that would permit crew members to move between the THABs and the central hub. The radius of rotation to the centre of the B330 modules is 84.6 metres, which, at 2 rpm, will provide Mars-level gravity. The front of the hub would provide a docking port for a Crew Dragon capsule. In order for a capsule to dock, the docking port would be able to counter-rotate in order to remain stationary relative to an approaching capsule. After docking, the connected capsule and docking port would gradually be spun up to 2 rpm to match the spacecraft, so the crew could enter the hub, then transfer through the arms to the THABs. Inside the hub would be a microgravity environment, with the apparent gravity level increasing with distance from the hub. Once the spacecraft is spun up, it would not need to be spun down again, because crews can enter and exit via the central hub. GNC and communication systems would be attached to the central hub where they will function more effectively, being easier to point at the stars or Earth respectively. If astronauts are able to tolerate higher rotation rates, or if the arms can be made longer, then the outbound journey could begin with Earth-level gravity and decreased to Mars-level gravity during the outbound journey by progressively reducing the spin rate. This would permit a gradual and stress-free adaptation to Mars gravity. On the return journey the process would be reversed, and the astronauts should, in theory, arrive back at Earth more-or-less fully recovered.